A dish to celebrate the late harvest. Despite the abundance of fresh produce in the summer, it can be tricky to eat healthy. If the weekend is here and the sun is out, you can guarantee the grill is getting fired up for lunch. When you think of grilling, most of us think of hotdogs, hamburgers, steak tips, and chicken kabobs. Not to put down any of those options (if enjoyed mindfully and on occasion), but when it's hot, I want something light, crisp and refreshing; which often makes me feel like I'm missing out on that grilled flavor. You haven't lived if you haven't had a fresh, local peach at the peak of summer. We were lucky this year and several of our weekly shares from our CSA were full of peaches. On their own, chopped up with Greek yogurt & granola, grilled and served with ice cream.... all fantastic. Grilled and thrown on a salad? Oh, it's a-ma-zing. I'd been wanting to play around with a grilled peach salad, so when we lit up the grill last week, I went for it. While my husband got his hotdogs out, I started quartering up a sweet and juicy peach. I looked around the kitchen to see what else I could do with the salad. I wanted something creamy to balance out the acidity of the peaches, but wanted to skip the cheese that day. A perfectly ripe avocado was ready, and I heard that they are great to grill too, so avocado it was. I cut a few segments, coated both with a little bit of grape seed oil and threw on the hot grill. You don't need a lot of ingredients to make a salad, a great salad, but you do want to make sure you have some different textures. I found a purple bell pepper from the grocery store the day before, so I sliced a few strips up to add an extra fresh crunch to the dish. I also had a bowl of these cute, tiny little tomatoes called Matt's Wild Cherry accumulating. It's always the best producers in our garden year after year, and they are so sweet and delicious. I wasn't sure if peaches and tomatoes particularly went together, but they were both going into this salad. One more thing - pecans. Pecans and peaches are practically best friends, so I couldn't imagine doing a grilled peach salad without them. Many people use candied pecans in salads. You know, I do enjoy those on occasion, depending on what else is in the salad, but in a salad like this, with sweet tomatoes and peaches, raw unsalted pecans work best. For a dressing, I wanted to pair the peaches with a balsamic vinaigrette. Earlier in the year I picked up an artisan variety Blackberry Ginger balsamic vinegar I knew could make a good dressing. It's on the sweet and fruity side, so its not one of those vinegars you can put on any salad, but its one that works so well when you are already incorporating fruit, as in this one. My trick with homemade dressing is to mix it in a small jar, as needed. Equal parts extra virgin olive oil to vinegar, plus a pinch of salt and pepper to taste. Screw a lid on the jar, shake to emulsify, and you are done! Making your own vinaigrette doesn't take any more than 30 seconds longer than pulling a store bought variety out of the refrigerator. Its definitely worth trying. When you are looking for a summer lunch that can be light, crisp and refreshing, while satisfying your need from something grilled, try a salad like this. Slices peaches to get about 6 segments from each. Cut up avocado into quarters. Place peaches and avocado slices onto a hot grill. Do not flip or turn until the first side has nice grill marks. You will know its reach to turn when the peaches and avocados are not sticking to the grate. Meanwhile, slice up the bell pepper, and get the rest of the salad together. Divide rinsed lettuce between two plates, and top each with sliced peppers, the cherry tomatoes and pecans. When the peaches and avocados have grill marks on both sides, place those on top of the salad. To make the dressing, put the olive oil, balsamic vinegar, salt and pepper in a small jar. Put a lid on and shake vigorously to emulsify. Divide between two salads to taste. If you can't find or don't have a Blackberry balsamic vinegar, just use regular balsamic. 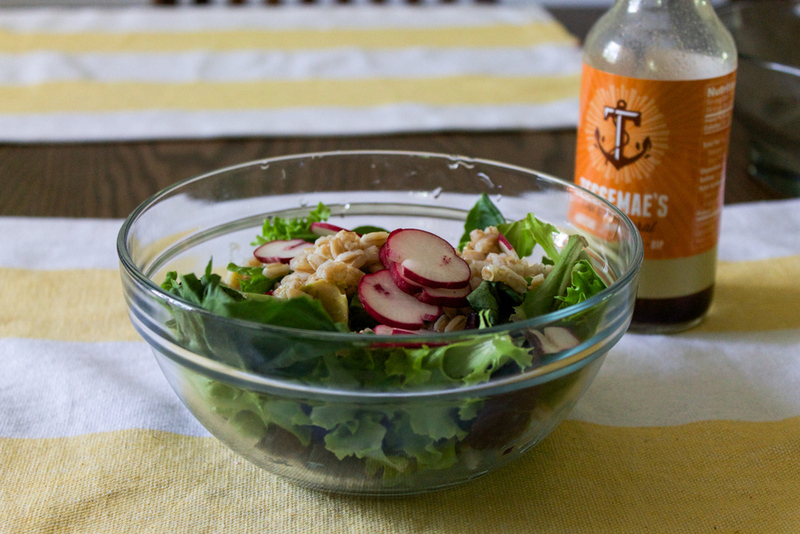 You can add a drop of honey to the dressing to sweeten it up a bit. Maintaining a food blog is a lot like working out; if you take a break, it's hard to start again. I know a lot about both. I love cooking and photography; both allow me to explore my creative side. It was that enjoyment and my desire to share healthy recipes that got me to start this food blog. This past summer was really exciting. We started a small garden, started raising our own chickens and I found myself training for my first 5k! Despite my best intentions of sharing more recipes throughout the summer, as you can tell. It just didn't happen. Without trying to explain myself, or make excuses, I'm simply going to say that there is a lot of work that goes into pulling a post together after the dish is prepare, and frankly, I didn't make that a priority. But, I'm back and resolved to start sharing recipes again! No surprise, with the start of the New Year, I'm refocusing on my health. I started the year off detoxing and eating completely clean. I haven't even had a drink since New Years Eve! I got back to a fitness regiment and signed up for a 15 class January yoga challenge. Last Saturday, after my 8am Vinyasa class I stopped by for the opening day of a Winter Farmer's Market hosted by a local garden center. This was exactly what I needed to start getting inspired again. I arrived about a half hour early, while the vendors were still setting up. It was a smart move because I got to scout out who was going to be there that week, and give myself enough time to line up for Red Fire Farm's stand, who sells amazing produce. Within a few minutes I scored some brussel sprouts, mixed lettuce, purple kale and butternut squash. I then quickly got in line to get some root vegetables from Winter Moon Roots. I don't like to pick favorites, but of all the vendors that I've seen at the market since I started going two years ago, Winter Moon Roots has one of the most alluring set-ups. 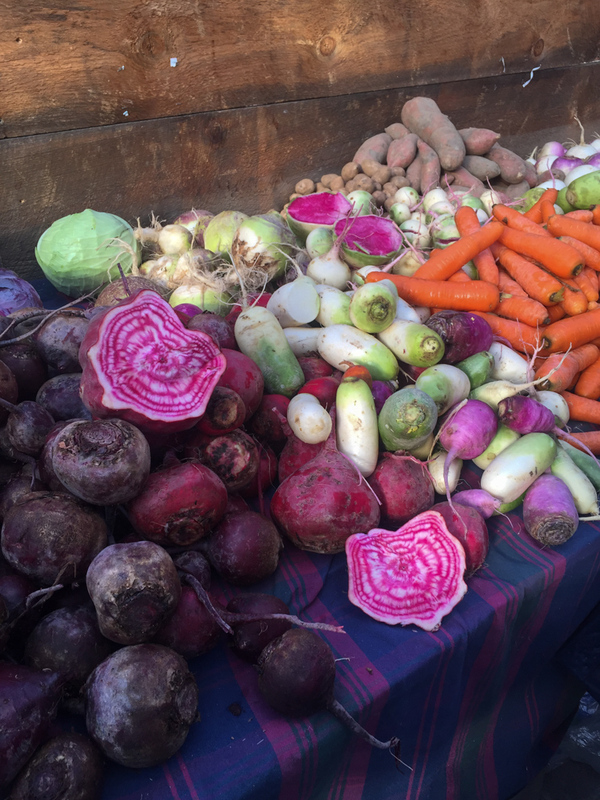 Their root vegetables range the full color spectrum, and the bright colors of the beets and carrots pull you in. Not only do they have a wide array of roots themselves (from parsnips to potatoes to turnips to radishes and more), they carry several varieties of each. Cleverly they slice open the produce to reveal the beauty inside. This week I couldn't help but pick up some cool looking "Psychedelic" or Chioggia beets. 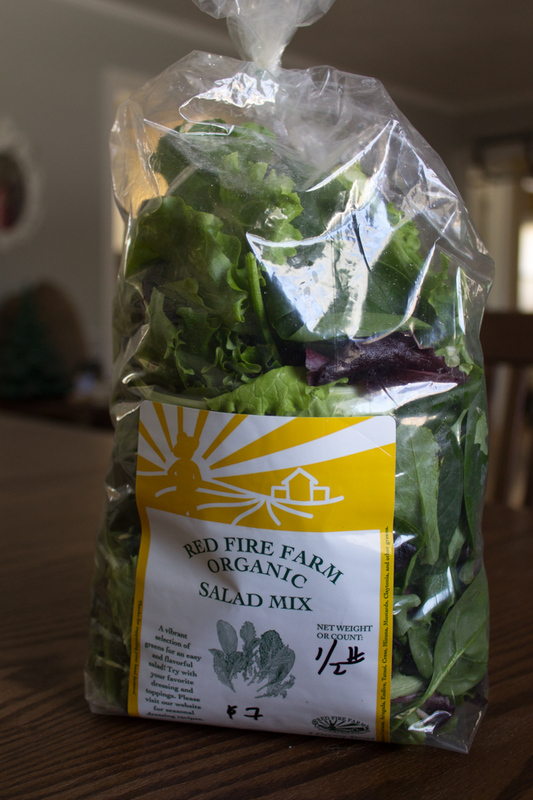 Inspiration for this winter salad instantly came after seeing the name and colors. I couldn't wait to go home and whip up my lunch. It's worth noting that the only thing "psychedelic" about these beets are their cool colors; they are not going to make you "trip"! Salads are usually easy dishes to pull together, but when making a beet salad, you do have to account for the time it takes to roast your beets. As soon as I returned home, I got my oven preheated, washed the beet I was going to use for the recipe, splashed it with some oil, wrapped it in foil and threw it in the oven. Cooking time varies greatly depending on the size of your beet, but I knew mine would need to roast for about 40 mins. Rather than wait around, that gave me plenty of time to unload my groceries, wash and prep my other produce for that week, and tidy up around the kitchen. Around the 40 min mark , I checked the doneness of the beet with a knife. It should be easy to puncture, as if you were checking on a baked potato. Pull it out of the oven and let it cool slightly before handling. With a pairing knife, gently scrape the outside skin. It will peel away easily. Discard. Slice or chop your beet however you choose. My beet was large enough that I saved half of it for other salads later in week. As it finished cooling I started assembling the salad. I started with super fresh mixed greens from the market - I especially like how there were varying shades of greens and some pops of reddish purple from the red leaf lettuce. To add another punch of color to play with the ruby colored beets, I shaved some red cabbage. I've talked a lot about beets, and while they inspired this salad, I didn't want them to be the star. No, they'd share the stage (or plate) with bright segments of orange. 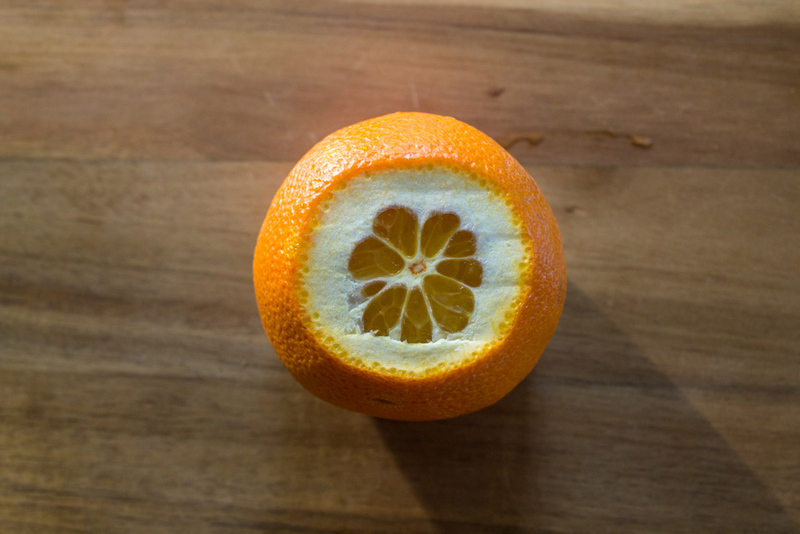 Oranges are one of those fruits that make getting through the winter a lot easier. They are a great reminder of warmer months ahead and packs a heavy punch of Vitamin-C, not to mention they taste delicious! You'll have to feel comfortable with your knife skills to segment out your orange, but after watching a quick video, I realized how easy it was. Greens, beets, citrus.... I needed some fat! Yes, all salads need, no, deserve a healthy fat. Avocado was going to be the perfect healthy fat for this salad. It was going to have the perfect creaminess to pair with the citrus notes from the orange segments and the vinaigrette (besides, I am partial to avocado). Seeds are also a great source of healthy fat for salads, and since I also wanted some crunch, I sprinkled on some unsalted pumpkin seeds I had on hand. And lastly, the dressing; a bright citrus vinaigrette to bring all the flavors together. Dressing is way to easy to make, so if you are still looking for a resolution this year, try to start making homemade dressing. Classic vinaigrette use equal parts oil to vinegar or something else acidic. My dressings usually use more vinegar and citrus juices, which pack big flavor without a lot of calories, than oil making mine 1 part oil to 2 parts vinegar. But there is really no way to mess it up. I took some extra virgin olive oil and added it to a small mason jar. Then I squeezed the leftover orange juice, plus juice of a lemon to give it a rounded citrus flavor. Finally I added a splash of white wine vinegar and a touch of salt and pepper. I covered the jar and gave it a shake to emulsify the dressing. When I make dressings, I'll make them in small batches. I only needed about 1-2 tablespoons for a single serving of my salad, leaving me with extra for other salads throughout the week. So there you have it! A beautifully bright and balanced salad with earthy beets, sweet oranges and creamy avocado to put a smile on your face in the dead of winter! Clean beets, leaving skin on, wrap in foil. Bake for 30-50 mins depending on size of beet until tender. Remove and let cool. Once you can easily handle the beet, use a pairing knife to scrape of the skin. In a small mason jar, add all the ingredients for the dressing and shake vigorously to emulsify. Use the dressing throughout the week for future meals. Add all the salad ingredients to a large bowl. Add 3-4 tbs of the dressing* and toss. *If you are saving half of the salad for a meal later in the week, store without the dressing. Just use 1-2 tablespoons for a single serving. After a long winter, and unseasonably cold Spring, I am so grateful for the weather to be improving. I could have done without the deluge today, but I am sure my garden loved it. I've been on a bit of a "hiatus" with the blog, but there has been plenty going on at, what now I refer to as, the "Turner Homestead". Most of our weekends have been spent in our backyard, on some exciting projects. In late March I ordered seeds from Johnny's Seeds, which had a great organic selection. Things were looking promising, with kale, lettuce, onions, tomatoes and peppers sprouting fast. In April we "broke grown" and built a raised garden bed to start growing some of our own produce this summer. We have tried to grow tomato plants in pots before, but before we ever had a chance to enjoy their fruit, a pesky squirrel or chipmunk would ravage the juicy ripe tomatoes. 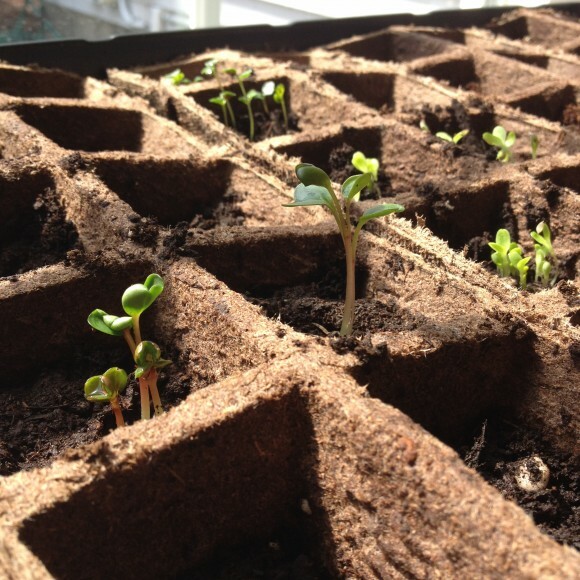 I was really excited to be growing produce from seed, but once we translanted the little sprouts into the garden bed, many stopped suspended in an infant state. We suspect it was because of the weather, but I'm sure it also had something to do with our little experience in growing vegetables. With such a short growing season in New England, we purhcased some addtional plants, that were more mature so we'd at least get something out of it. However, in the last week or so, some of what I started from seeds have started growing like crazy. Our kale and boston lettuce is going through a growth spurt and the Rudolph Radishes I planted are ready to pick! This week for lunch I enjoyed a delicious salad served in a pita pocket using fresh radish straight from my own garden. There is truely something special about eating food your grow yourself. Thats what I love about having a dedicated vegetable garden. I can grow what I want, how I want it, organically, without pesticides and enjoy it FRESH. I am the only one who is handling it before it gets on the plate. laying hens. Most of our time the last month or so has been dedicated to builidng a coop for the girls. They've just officially moved out of the brooder we had inside, to the custom coop at the end of May and are LOVING their new home. Are you crazy? Maybe, but I'm okay with being a crazy chicken lady. I'll have the freshest eggs on the block! You'd be amazed in just how fast these things grow! I swear, the first couple weeks, I'd come home from work and they'd look totally different than they had that same morning. They are 9 weeks now and resemble mini-chickens. Here is the same girl, all black. If you want to see more pictures of the chicks, you can head to the Mindful Glutton Facebook page. You can expect I will have some amazing recipes using the freshest eggs you can imagine come August. But lets get back to those RADISHES. If you haven't tried radishes, or are looking for ways to use them, salads are perfect. They are slighly peppery, crisp like an apple, and add a great crunch (not to mention packed with awesome vitamins and nutriets). Ever wonder what makes a perfect salad? For me, its about fresh mixed greens, something crunchy, a creamy fat, and a tasty vinegrette. Chances are, at anytime, I will have all those "essentials" at home. For this healthy lunch option, I employ organic mixed greens, avocado (radish's best friend), some leftover farro I had from earlier in the week, and a tangy soy ginger vinegrette I picked up a few weeks ago.
. I tried a sample at Whole Foods and loved it. They keep their ingredients simple, which I appreciate, and stay away from icky articifial ingredients. I cant speak to all their products, but this one has no preservatives and I can pronounce and know all the indredients listed. I suppose I could make my own, but love this as a quick go-to. version, thats low in calories, but filling. You can certainly opt out, or use half a pita, and eat the rest of the salad as a side. Mix salad, radishes, avocado, farro, vinaigrette, and squeeze of lemon into bowl and toss. 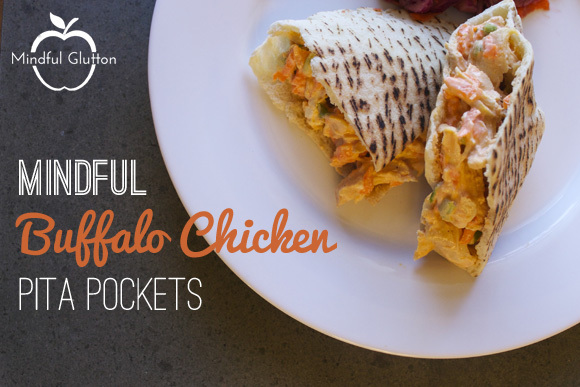 Serve as a salad, or stuff inside of a pita pocket and enjoy. This week is all about the avocado. So far we've seen it in a pesto, a topping for your breakfast and today you'll see it as a garnish for a beautiful and delicious Sweet Pototo Soup. When it comes to food I know I throw around the words "favorite" and "love" a lot, but sweet potatoes and avocados are some of my favorite foods. They are definitely things I have to have year round regardless of when they are in season. I haven't had a chance to visit the local Winter Farmers Market has just opened this weekend, but I did get to get some great organic sweet potatoes from Trader Joes. There are so many great ways to enjoy them, but this past weekend I decided to make soup. Whenever I'm in doubt of what to do with fresh veggies, I usually opt for a soup. Like most of my soups, I start off by throwing the veggies in the oven. I just through the oven on 350, wrapped 3 sweet potatoes in tin foil, and let bake until tender. If you were trying to save time you could always microwave them but I prefer the oven. Often I'll add olive oil to whatever I'm roasting but because I would be discarding the skins, I didn't bother. Let the potatoes to cool slightly before touching. Slice open and scoop the flesh into a pot. Set to medium heat and add 2 cups of vegetable stock. Use a potato masher to break down to large pieces of potato. Next use your immersion blender to start blending the soup. You'll likely need more liquid, the size of the potatoes will determine how much. I ended up adding another cup of vegetable stock and a cup of coconut milk (because I had it on hand). You can stick to vegetable/chicken stock or just water depending on how thick you like your soup. When the soup got to a simmer I turned the heat down to low. That's when I added pepper, sea salt, paprika, and a dash of cumin to taste. The soup itself is very simple, but it's the garnishes that make it special. Serve with cubed avocado and crushed blue tortilla chips on top and a wedge of lime on the side. Set oven to 350. Clean sweet potatoes and dry them off. Wrap sweet potatoes in foil and bake in oven about 40 mins or until fork tender. Let cool slightly, and when they can be easily handled, cut open sweet potatoes and scoop out insides. Begin to heat a medium to large size pot to medium low. Add sweet potatoes, spices and 1 cup of coconut milk to pot. Use a masher to begin to break up sweet potato. Begin to add some of the vegetable broth, about 1/2 cup at a time. Begin to puree soup with immersion blender. Continue to slowly add vegetable broth until you get to the desired thickness of soup. For thicker soup you will probably only need about 1 cup... for thinner soup, use up to 2 cups*. Turn heat up until the soup starts to bubble and then return to a slow simmer and let cook for another 10 mins. Serve with diced avocado, crushed tortilla chips and a squeeze of lime. * The amount of vegetable stock needed varies greatly depending on the size of your sweet potatoes and preference. As much as I can, I like to buy and eat seasonal produce. But one of my absolute favorite health foods is avocado. I suppose you can consider it "in season" thanks to Mexico, which makes it available year round. Anyway, I probably eat avocado everyday, incorporating it as a healthy fat. I love them so much I decided to dedicate a week of posts to this beautiful vibrant fruit! There are many uses for avocado, but have you ever considered using it in pesto? Pesto itself is extremely versatile so you could use this as a sauce over pasta, a spread, or in wrap like this recipe! You only need a few ingredients and a food processor. I make this is small batches since the avocados oxidize, turning the pesto a brownish color over the course of the next few days. The added citrus helps with that, but we eat with our eyes too, so the more vibrant the better! First, start off by pulsing 1/4 cup of raw, unsalted cashews in the food processor to break up slightly. Traditional pestos use pinenuts, which are fine to use but I had a jar of cashews (which I had recently used in a Kale Pesto) and wanted to use again. Next, I add the flesh of one ripe avocado, 2-3 peeled cloves of garlic, 1/2 cup of grated Parmesan (or Pecorino Romano) cheese, a packed cup or more of fresh basil, juice from half a lemon and a pinch of sea salt and pepper. * you can adjust the amount of basil you'd like depending on your taste - I usually use one package worth if I buy from a grocery store. Blend the ingredients. As they start to incorporate, slowly drizzle in 2-3 tablespoons of olive oil. There is already plenty of (healthy) fat, in the avocado, so you want to use discretion with the olive oil. Its simply to help smooth everything out. Now all you have to do is decide what you want to use the pesto on! The first time I made it I ate with spaghetti squash and it was absolutely delicious. I would have done the same the other night when I made this batch but didn't want to wait for the squash to roast. Instead, I heated up some turkey breast I had roasted the night before and tossed with a few tablespoons of the avocado pesto. I added it to a wheat flour wrap with baby arugula and crunchy sliced red pepper. Simple. Delicious. Add all other remaining ingredients (besides olive oil) and blend until smooth. I can't say enough good thing about squash. They are a great source of anti-oxidants, vitamin C, Omega-3s, helps to regulate blood sugar levels, and overall promotes optimal health...and they are really delicious. It's sort of funny, but the first time I ever tried squash was this year through the farm I was a part of. Squash comes in many varieties from summer squash like zucchini to winter varieties (my favorite) including butternut, delicata, and spaghetti squash. Squash is a must add to your grocery list. If you are new to squash or have picky eaters at home, soup is the perfect vehicle to introduce this wonderful vegetable. This recipe particular recipe will warm your soul during cold fall and winter days and is very easy to prepare. I usually get pretty excited when I see squash soup on a menu when I go out to dinner, but the few times I've ordered it I've been disappointed. In my quest to eat healthier, I cut out extra calories where I can. Each time I've ordered butternut soup this year its always made with a ton of extra cream. It absolutely drives me crazy, because you don't need to use heavy cream/milk to make a great squash soup. I've enjoyed many soups that don't have a drop of cream that are silky smooth and delicious. I do agree that cream can help balance out flavors but its really high in calories and fat - and there are plenty of great subsitutes. I'm using unsweetened coconut milk in this soup. It will help give the soup that silky texture, without all the fat and calories. The flavor of coconut can be really polarizing. But let me say that the flavor of both the coconut milk and the coconut oil the recipe calls for is extremely mild. If you absolutely abhor coconut (or are allegric) subtitute with almond milk and another oil. Believe me, the coconut milk this recipe calls for is NOT what you are accustom to having in a Pina Colada, nor will it taste like sun tan lotion. The slight coconut flavor from these ingredients really pairs so well with the rich spices we're using. You have to trust me on this one. Spices play an important role in this recipe; the star, saffron. Saffron is one of the most expensive food items by weight. Each thread-like strand of saffron come from the stamen of a crocus. Since each flower only has three stamens, it takes an acre of crocus crop to yield one pound of the stuff! Thankfully, a little goes a long way and you should be able to get a small jar relatively cheap. I've seen it from Trader Joe's for about $12. For this recipe I used saffron that my brother brought home for me from Spain (where saffron is most commonly cultivated and sold). The flavor of saffron is very unique - and hard to describe. It's very floral and you can get immense flavor from just a few strands. I've made the mistake of adding too much to a dish and it was very over-powering. For this recipe I only used about a quarter of that little pile you see in the picture below. While saffron makes this dish special, the soup wouldn't be complete without a few other friends like paprika, cumin, coriander, curry and white pepper. Paprika was the most obvious accomponiate to the saffron, because its also a Spanish spice. You can buy sweet or smoked paprika, either will do in this dish. Contrary to what some may think, paprika is not spicy so you can use it liberally. This dish only needs a tablespoon. Next, I added cumin, which will give a smokey heat to the dish. The cumin is what really makes this soup so comforting and warming on a cold New England day. In lesser amounts I also added some coriander and curry. Neither is absolutely necessary, but I felt it really rounded out the flavors. I choose white pepper over traditional black pepper just for looks (so if you don't have it, use regular pepper). The toughest part to this recipe is preparing the squash. You will need a good vegetable peeler, sharp knife, and a bit of muscle. Can a half inch from the bottom and top of the squash first. Next, peel the skin off. Because you've cut the bottom you can stand the squash upright to stabilize it. After its peeled, use a heavy chef's knife to cut it in half the long way. Use a large spoon to pull out the seeds (you can clean and roast these just like pumpkin seeds if you like). Finally, dice into one inch cubes. The onion and garlic will be much easier to handle. Simply peel and quarter the onion, and add it to your bowl of squash. The garlic gloves can be tossed in whole (to help avoid burning) after they have been peeled as well. I haven't met a vegetable that doesn't like roasting. I think the way these veggies are prepared for the soup make it extra flavorful. Many soup recipes I see simply call for sauteeing or steaming the vegetables, but I love the carmelization that happens during roasting. The only downside is that you tend to loose more nutriets roasting than steaming, but the flavor is phenomenal. I roast the vegetables with the dry spices (not the saffron yet) to help bring out their aromatics. A key part of roasting your vegetables is choosing your oil. When it comes to healthy eating there are definatley oils to avoid (canola/vegetable), so I normally stick to olive oil or grapeseed oil. However, I've recently started using coconut oil in my cooking and I really love it. Virgin coconut oil is a healthy saturated fat. When you buy it, it actually is in a solid state, it doesnt turn to liquid until its warmed up. What makes coconut oil so amazing is that it can handle higher tempatures and safely convert from a solid to liquid state and back, without breaking down. The reason to be concerned about overheating oils is because as an oil exceeds its burning point, it starts to break down and they turn into a carcinogen (cancer causing agents). You will have to warm up the jar in the microwave to covert to a liquid before measuring out the tablespoon for this recipe. Just make sure the cover is off and you don't put any metal in the microwave. Toss the chopped veggies, spices (except saffron) and oil in a bowl to coat evenly and spread out a baking sheet. Add a few pinches of salt to everything. Roast in a 400° oven for 25-30 minutes, turning occasionally, until the butternut squash is fork tender. When the veggies are done recipe. Start working on the broth. Pour the coconut milk into a large pot (big enough to hold all the roasted veggies) and turn onto medium heat. Add the saffron strands. I waited to add saffron until this point, because it would have burnt in the oven. Instead, I add them to the milk so the flavors bloom. You will see the white coconut milk turn yellow. You only need to wait a minute or so and you can go ahead and add the vegetables to you pot. Blend with an immersion blender*. Slowly add the vegetable broth. You may not need all two cups so add it slowly until you reach the desired consitency. If the soup is still too thick, you can add a bit more liquid either from the coconut milk or vegetable broth. Turn to low, and let the soup cook another 15 mins before serving to allow the flavors to mellow. *If you don't have an immersion blender, you can use a regular blender. Just make sure it was made for hot liquids and hold a towel over the top in case it explodes. Return the soup to the pot after blending to allow to simmer as above. Finally, taste and season with salt, as needed. I like to leave that until the last step once you can try all the flavors together. Serve the soup with a dollop of sour cream, greek yogurt, or a drizzle of olive oil. Peel butternut squash. Cut in half, remove seeds and chop into one inch cubes. Peel and quarter one medium onion. Peel 2 garlic cloves. Place butternut squash, onion and garlic into mixing bowl. Warm up virgin coconut oil (if in solid form) and add 1 tbs to the vegetables. Add in paprika, cumin, coriander, curry and 1 tsp salt. Toss to coat evenly. (Do not add in the saffron at this time). Lay vegetables on baking sheet and place in oven for 25-35 mins until the squash is fork tender. Turn vegetables half way through so they caramelize and cook evenly. Once you pull roasted vegetables out of the oven, start warming the coconut milk over medium heat in a large pot. Add the saffron to let steep. The white coconut milk will turn yellow. After waiting a minute for the saffron to steep, add in all the roasted vegetables plus any liquids from roasting. 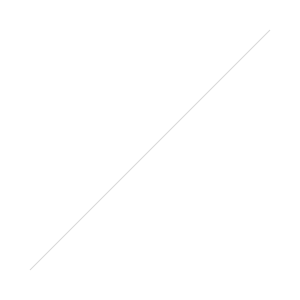 Use an immersion blender to start pureeing into a soup (if you do not have an immersion blender, transfer into a regular blender safe for hot liquids). Add 1-2 cups of vegetable stock until you reach the desired consistency. If full 2 cups of vegetable stock isn't enough, add more coconut milk or stock based on your preferences. Let soup simmer on low another 10-15 minutes to full absorb saffron flavor. Add extra salt to taste as needed. Serve with a dollop of sour cream, greek yogurt or drizzle of extra virgin olive oil.